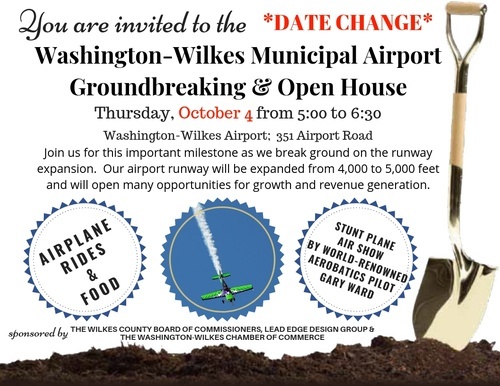 You are invited to the Groundbreaking & Open House at the Washington-Wilkes Municipal Airport.. Guests will enjoy Airplane Rides, A Cook-out & A Mini Stunt Plane Show by World Renowned Aerobatics Pilot Gary Ward. Be sure to check out Gary's video below! This annual event is all about keeping the public familiarized with airport facilities, operations and future development plans. It’s a great opportunity to see and learn about all the services our airport provides. Earlier this year the Wilkes County Board of Commissioners authorized approval of construction contracts to extend the Washington-Wilkes Municipal Airport runway from 4,000 to 5,000 feet, a milestone length that will open many opportunities for growth and revenue generation. Having worked on getting to this point for more than 25 years, the county was selected by the Georgia Department of Transportation (GDOT) to be included in a windfall distribution of grants earlier this year. The Wilkes County airport is one of only 11 in the state considered for these grants.